Agarwood is known to generate a distinct fragrance upon heating and is used as both a medicine and a fragrant wood. Low molecular weight aromatic compounds (LACs) such as benzylacetone are emitted from agarwood on heating and have a sedative effect on mice. These are detected exclusively in the headspace vapor of heated agarwood and are absent in the wood itself; hence, some compounds in agarwood are thought to be converted to LACs by the process of heating. In this study, different fractions obtained from agarwood were analyzed to reveal the source compounds of LACs. Some LACs detected in the resinous agarwood were absent from the non-resinous parts and confirmed as characteristic of the resinous parts. The essential oil and hydrosol of agarwood obtained by distillation were analyzed by gas chromatography–mass spectrometry (GC–MS). 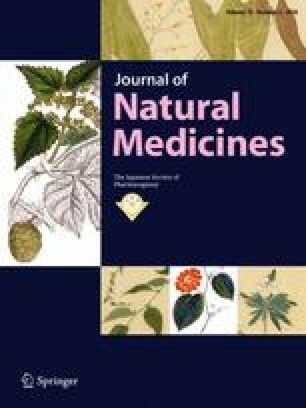 Sesquiterpenes were detected in the essential oil, and sesquiterpenes and a variety of LACs were detected in the hydrosol. A hot water extract of agarwood remaining in the distillation flask after distillation was analyzed by high-performance liquid chromatography (HPLC), and agarotetrol was found to be the main compound. Purified agarotetrol was heated in a glass vial and its headspace vapor was analyzed by solid-phase microextraction GC–MS. Benzylacetone and other LACs were detected. These results indicate that agarotetrol, a chromone derivative, contributes to the fragrance of agarwood through the generation of LACs upon heating.